Iron deficiency anemia is the most prevalent micronutrient deficiency worldwide. Iron is needed to make hemoglobin, which is a substance in red blood cells that enables them to carry oxygen. There are two forms of dietary iron, heme (from hemoglobin and myoglobin) and non-heme. Heme iron comes from animal-based food sources such as meat, poultry, and fish. 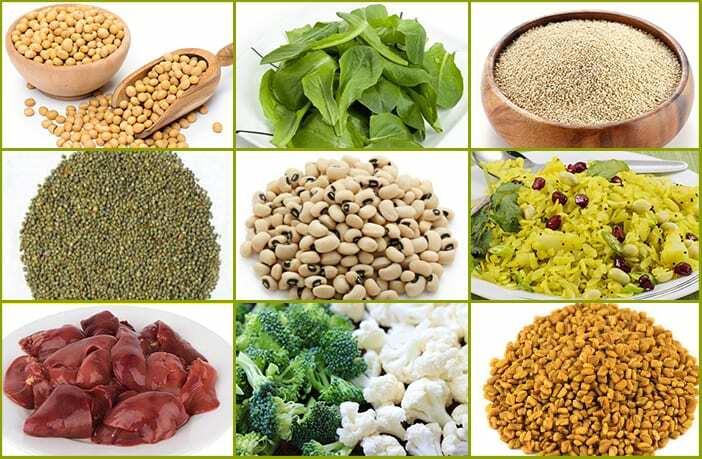 Non-heme iron comes from plant-based sources such as legumes, green leafy vegetables, and whole grains. Heme iron has an absorption rate of about 25%, while non-heme iron has about a 16% absorption rate. Iron-rich animal sources include red meat, oysters and other seafood, chicken, turkey, and pork. Although absorption of iron from plant-based sources is lower, people eating vegetarian/vegan diets rely solely on these sources for iron. The iron requirement can be met while on a strict plant-based diet. Adding vitamin C (such as orange juice) to vegetarian sources will enhance absorption. Examples of plant-based iron sources include beans and lentils, tofu, dark green leafy vegetables such as spinach and kale, whole grain and enriched breads, ready-to-eat breakfast cereals, nuts, and dark chocolate. Some populations are at higher risk for iron deficiency anemia. Women of childbearing age lose some iron every month during menstruation. This puts them at greater risk for iron deficiency anemia than men. The RDA is also higher for women than for men. Pregnant women have an increased blood volume which requires more iron to drive oxygen to the baby and growing reproductive organs. It is very important that pregnant women follow a balanced diet, as well as take their prenatal vitamins throughout the pregnancy. After six months of age, iron needs increase for babies. Breast milk and iron-fortified formula can usually supply enough iron not met by solid foods. Cow’s milk can cause iron deficiency, because it is a poor source of iron, and the baby can refuse iron rich food sources because the cow’s milk is very filling. Cow’s milk should be avoided until age one, and then limited to no more than four cups a day. Finally, people who have intestinal disorders such as celiac disease have trouble absorbing nutrients from digested food, which can lead to iron deficiency anemia. If part of the small intestine has been bypassed or removed surgically, that may affect your ability to absorb iron and other nutrients. Complications of long term iron deficiency include heart problems as the heart has to pump more blood to compensate for the lack of oxygen carried in the blood. This can eventually lead to an enlarged heart, or even heart failure. Severe iron deficiency during pregnancy has been linked to premature delivery, low birth weight, and increased perinatal mortality. Severe iron deficiency in infants and children can lead to delayed growth and development. Finally, long term iron deficiency increases an individual’s susceptibility to infections. To prevent iron deficiency anemia, eat a balanced, healthy diet filled with good sources of iron. Combine iron rich foods with vitamin C to increase absorption. Vitamin C rich foods include broccoli, grapefruit, kiwi, oranges, strawberries, and tomatoes. If you take supplements, swallow them with orange juice or lemonade. Finally, cooking food in cast iron pans increases the iron content of the food as the iron leaches into the food from the pan.